(Nanowerk News) Researchers in Chicago and London have developed a method for controlling the properties of magnets that could be used to improve the storage capacity of next-generation computer hard drives. Magnets that can readily switch their polarity are widely used in the computer industry for data storage, but they present an engineering challenge: A magnet’s polarity must be easily switched when writing data to memory, but be difficult to switch when storing or reading it. 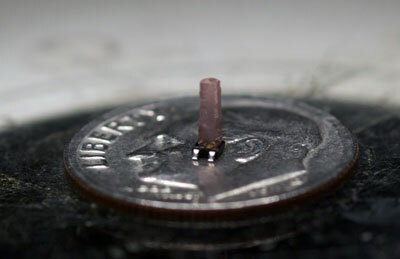 A magnetic crystal sits on the head of a dime for scale. Scientists exploit the randomness of the magnetic field in the crystal at the molecular level to control the properties of the magnet as a whole. The chip underneath the crystal is a magnetic sensor. These conflicting requirements are typically met by heating and softening the magnet for saving data, then cooling and hardening the magnet for storage and reading. But now the University of Chicago’s Daniel Silevitch and Thomas Rosenbaum and Gabriel Aeppli of the London Centre for Nanotechnology (a joint enterprise of University and Imperial Colleges London) have filed a patent on a method that avoids this complex heating operation. As the trio report in the Proceedings of the National Academy of Sciences ("Switchable hardening of a ferromagnet at fixed temperature"), they can tune the softness of the magnet with the application of a small external magnetic field, which allows writing, storage and readout at a fixed temperature.